The type of fabrics used to make wedding dresses can break or make the wedding dress. Knowledge of fabric types can stengthen your analytical skills in asking the right question and increase your chances in selecting the perfect dress with the most perfect and flattering fabric for your body shape! Below is a brief description of the type of fabrics used for wedding dresses. Bridal Satin: smooth fabric made from synthetic fibers in a tight weave that creates a luxurious shine. Widely available in silk, polyester, acetate, and rayon. Brocade: a heavy, thick jacquard (anchor to jacquard) fabric with an overall interwoven pattern or floral design that is raised. Gives your dress a rich feel and exquisite look! Charmeuse: popular lightweight fabric made of silk or polyester that creates a soft luster and satin like appearance. Drapes with great grace! Crepe: covers a wide range of fabrics including synthetics and silk identified by a grainy surface that can crinkle or crimp. Crepe back satin: a light to mid-weight reversible fabric: smooth, high luster satin weave on one faces; dull crepe weave backing on other face. Both sides can be used! Chiffon: lightweight, sheer and transparent fabric with soft feel and delicate look. Ideal for flowing designs. Season-less fabric! Crushed Velvet: thick pile of different heights make this woven fabric have a crushed look. Added elegance: glimmers in certain light. Crepe de Chine: Softer and shiner than crepe back satin and lighter in weight. Typically rayon or silk. 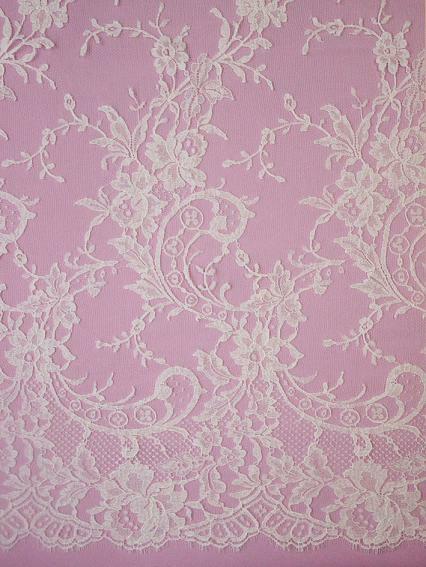 Damask: distinctive fabric noted by soft sheen and woven pattern same color as the background, usually a floral design. 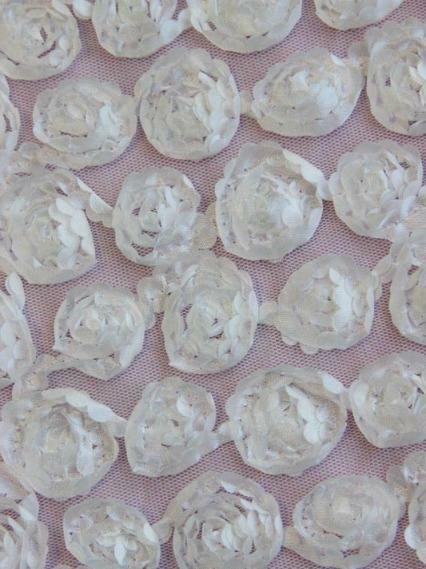 Dupioni Silk: textured fabric with highly irregular weave, tiny nubs on surface and rich luster. Heavier and thicker texture than Shantung silk. Duchesse Satin: smooth, full bodied fabric with sheen often a mix of silk and man-made fibers such as polyester, acetate or rayon makes it a favorite for full or A-line skirts. Faille: stiff fabric with ribbed texture made from such fibers as polyester, cotton and silk. Georgette: lightweight, sheer fabric often made from silk or man-made fibers such as polyester. More opaque than chiffon. Illusion: transparent, thin fabric typically used to create sheer sleeves, bodices, and backs. Jacquard: soft and silky woven fabric with a pattern weave. Brocade and Damask are jacquard woven fabrics. Lace: delicate netting or an openwork fabric, patterned with open holes in the work, made by machine or by hand. The holes can be formed via removal of threads or cloth from a previously woven fabric, but more often open spaces are created as part of the lace fabric. A true lace is created when a thread is looped, twisted or braided to other threads independently from a backing fabric. Originally linen, silk, gold, or silver threads were used. 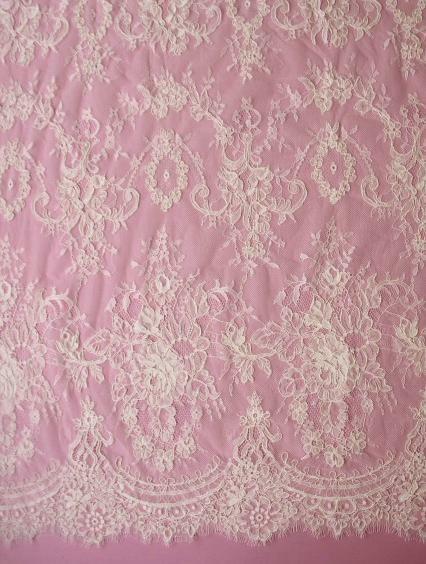 Now lace is often made with cotton thread, although linen and silk threads are still available. Manufactured lace may be made of synthetic fiber. A few modern artists make lace with a fine copper or silver wire instead of thread. 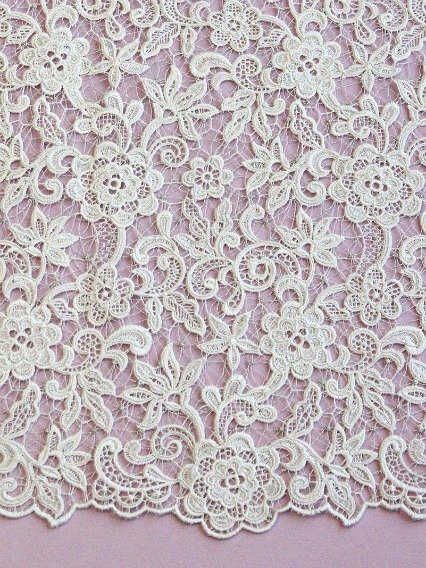 Chantilly or Galloon Lace: Possibly the best known type of lace is very fine and delicate and is made on a lightweight hexagonal mesh background. The motifs are sometimes outlined in a heavier silky thread or exhibit shading effects. Chantilly laces normally have doubles scalloped edges. Kate Middelton's royal wedding dress was made of a type of Chantilly lace. Beaded Lace: Especially popular in the last 12 months, the type of lace is embellished with beads, crystals and sequins to produce a slightly antique look. They often have a scalloped edge. Corded Lace: These laces are elegant and originally were made exclusively in Northern France. Also known as Alencon lace, they are formed by outlining areas in the lace using a heavier thread or cord, giving these laces a three dimensional look. They are generally fine, light and floaty and make beautiful wedding dresses. Guipure lace: This lace always has a continuous motif, which creates a denser pattern than with other laces. 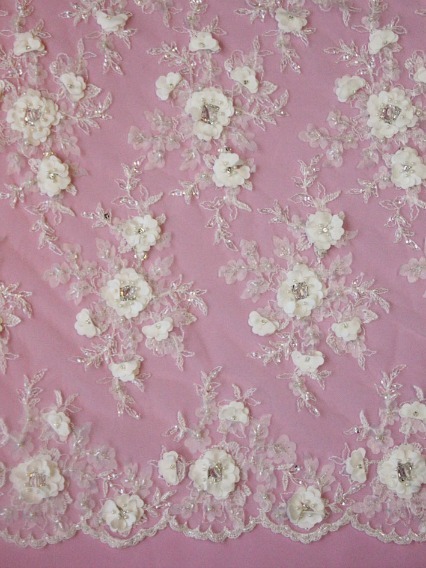 It is normally quite a firm feeling lace and commonly contains a floral or geometric design. 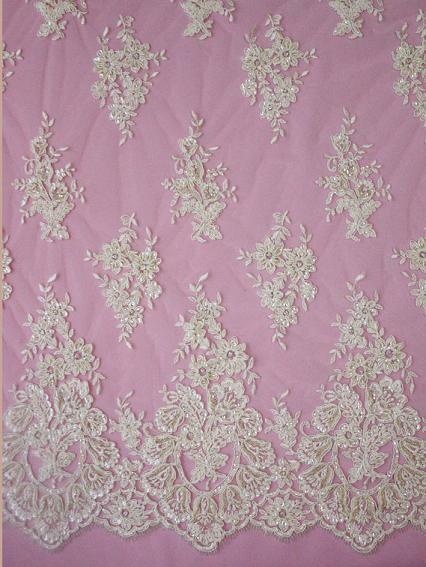 One of the earliest types of lace, it is also sometimes known as Venetian Lace. Linen: lightweight natural fabric made from flax fiber used for more casual clothing. Matte: smooth fabric without a shine or glass. Moiré: stiff fabric with a design woven in, creating a watermark effect usually of silk or polyester. Organza: crisp, sheer, transparent and lightweight fabric made from silk, nylon, or polyester. Heavier and stiffer feel than chiffon works well in wedding gowns for overskirt. Peau de soie: (French for skin of silk) medium to heavy fabric with a satin weave and dull luster. Peau Satin: heavy twill satin with a smooth finish and soft shine. Satin: soft woven fabric with a lustrous smooth surface and back in a wide range of sheens popular for formal dresses. Silk: luxurious natural fiber woven from the fibers of silkworm cocoons that come in a variety of textures with finishes. Soft, elegant and strong. Shantung: medium-weight, plain-weave fabric in silk or polyester with a nub feel and textured effect. 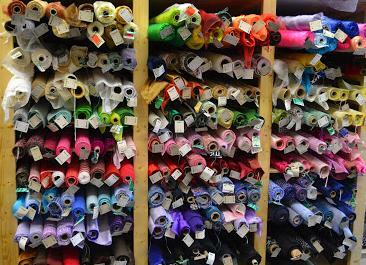 Taffeta: light to heavy synthetic fabric with body, crispness, and sheen. Smooth surface shines when hit by light. Adds stiffness to full skirts on ball gowns. Tulle: Light, transparent and fine open weave netting often sewn for wedding veils and layered for ball gown skirts. Velvet: luxurious heavyweight fabric woven with a cut pile finish made of silk, velvet or rayon. Finish creates a soft feel with subtle shine.